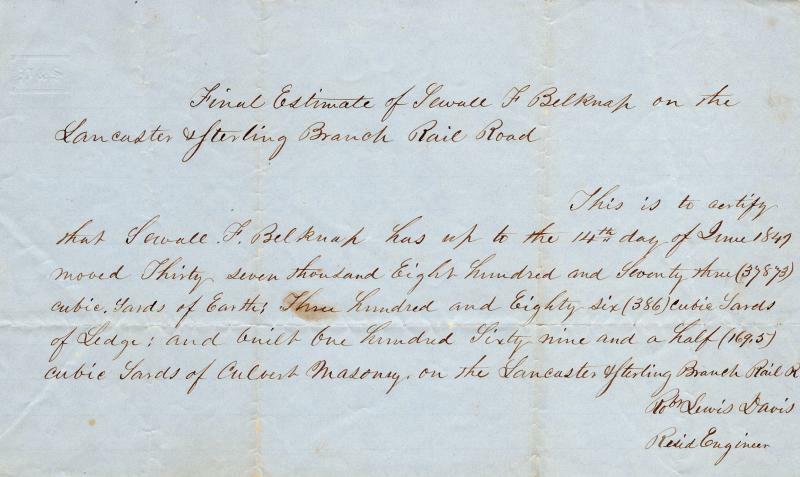 A note of final estimate written by Robert Lewis Davis, Resident Engineer, for the work of Sewall F. Belknap in 1849. The Belknap Company moved 37,873 cubic yards of earth; moved 386 cubic yards of ledge; and, built 169.5 cubic yards of culvert masonry on the Lancaster & Sterling Rail Road. The note is dated June 14, 1849. Paper, 4.5 x 8 in. 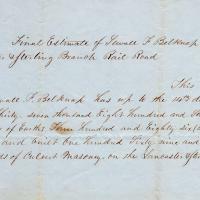 “Final Estimate of Earth Work for Fitchburg RR - 1849,” Maynard Historical Society Archives, accessed April 24, 2019, http://collection.maynardhistory.org/items/show/6591.